The 1st Georgia Bass Slam of 2018 has been hit! You may not be the first of 2018, but the good news is you’ve still got plenty of time. This week we’ll focus on the elusive Altamaha bass with the help of nongame conservation assistant chief, Matt Elliott. 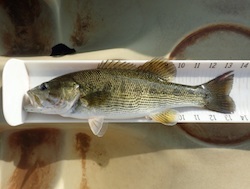 This little bass is found above the fall line in streams that the Ocmulgee, Oconee, and Ogeechee river basins flow into.Try targeting them in the Yellow, Alcovy, Towaliga, any forks of the Oconee River and in the mainstem Oconee River down to Milledgeville. There are some excellent spots for Altamaha bass in both the Little River and Murder Creek, in the Oconee National Forest. Kayaking is possible in the Little River, but to fish Murder Creek your best bet is wade in or bank fish. The North Oconee River just below Athens at Whitehall Road is another place to wet a line while trying to nab an Altamaha. There’s some hybridization with non-native spotted bass going on here, though. You can find public parking on Athens-Clarke County property on the northeast side of the road or you can walk up a trail along the east side of the river on public land. View an interactive map of where to find Altamaha bass and public access points. Like the Chattahoochee Bass, Altamaha’s can be found in a and about shoal complexes. Just cast the lures into any little eddy or pool, especially in rocky shoal areas, and retrieve. They will absolutely nail spinners of about 1/8 oz in size, Panther Martins or Rooster Tails. 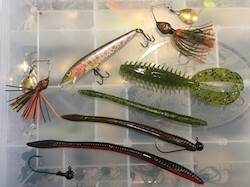 Small topwater lures also work great, as do smaller plastic worms fished without a weight. “If I’m catching a lot of small bass like Altamaha bass, I like to clip off 2 of the treble hooks and crimp down the barb so they can be released more easily. They have a tendency to inhale the spinners,” says Matt Elliott.